Richard Samuel (August 29th, 1923 – August 24th, 2014) was an English actor, film director, film producer, and entrepreneur, and he was also the President of the Royal Academy of Dramatic Art (RADA), as well as the British Academy of Film and Television Arts (BAFTA). As a film director and producer, Attenborough won two Academy Awards for Gandhi in 1983. He also won four BAFTA Awards and four Golden Globe Awards. As an actor, he is perhaps best known for his roles in The Great Escape, The Lost World: Jurassic Park, Miracle on 34th Street and Jurassic Park. The older brother of both David Attenborough, a famous naturalist and broadcaster, and John Attenborough, an executive at Alfa Romeo. He was married to actress Sheila Sim from 1945 until his death. Attenborough was born on August 29th, 1923, in Cambridge, the eldest of three sons of Mary Attenborough, a founding member of the Marriage Guidance Council, and Frederick Levi Attenborough, an academic administrator and scholar who was a fellow at Emmanuel College, Cambridge, and wrote a standard text on Anglo-Saxon law. Attenborough attended school at Wyggeston Grammar School for Boys in Leicester and studied at RADA. In September 1939, the Attenboroughs took in two German-Jewish refugee girls, Helga and Irene Bejach (ages nine and eleven), who lived with them in College House and were adopted by the family after the war when it was discovered that their parents had been killed. The sisters moved to America in the 1950s and lived with an uncle, where they married and took American citizenship; Irene died in 1992 and Helga in 2005. During the Second World War, Attenborough served in the Royal Air Force. After initial pilot training he was seconded to the newly formed RAF Film Unit at Pinewood Studios, under the command of Flight Lieutenant John Boulting, where he appeared with Edward G. Robinson in the propaganda film Journey Together in 1943. Afterward, he volunteered to fly with the Film Unit and after further training, where he sustained permanent ear damage, qualified as a sergeant, flying on several missions over Europe filming from the rear gunner’s position to record the outcome of Bomber Command sorties. Attenborough’s acting career started on stage and he appeared in shows at Leicester’s Little Theatre, Dover Street, prior to his going to RADA, where he remained Patron until his death. Attenborough’s film career began in 1942 in an uncredited role as a deserting sailor in the Noël Coward/David Lean production In Which We Serve (his name and character were accidentally omitted from the original release-print credits), a role which would help to type-cast him for many years as spivs or cowards in films like London Belongs to Me (1948), Morning Departure (1950) and his breakthrough role as Pinkie Brown in John Boulting’s film adaptation of Graham Greene’s novel Brighton Rock (1947), a part that he had previously played to great acclaim at the Garrick Theatre in 1942. In 1963, he appeared in the ensemble cast of The Great Escape as RAF Squadron Leader Roger Bartlett (“Big X”), the head of the escape committee, based on the real-life exploits of Roger Bushell. It was his first appearance in a major Hollywood film blockbuster and his most successful film thus far. During the 1960s, he expanded his range of character roles in films such as Séance on a Wet Afternoon (1964) and Guns at Batasi (1964), for which he won the BAFTA Award for Best Actor for his portrayal of the Regimental Sergeant Major. In 1965 he played Lew Moran opposite James Stewart in The Flight of the Phoenixand in 1967 and 1968, he won back-to-back Golden Globe Awards in the category of Best Supporting Actor, the first time for The Sand Pebbles, again co-starring Steve McQueen, and the second time for Doctor Dolittle starring Rex Harrison. His portrayal of the serial killer John Christie in 10 Rillington Place (1971) garnered excellent reviews. He took no acting roles following his appearance in Otto Preminger’s version of The Human Factor (1979) until his appearance as the eccentric developer John Hammond in Steven Spielberg’s Jurassic Park (1993) and the film’s sequel, The Lost World: Jurassic Park (1997). He made his only appearance in a film adaptation of Shakespeare when he played the British ambassador who announces that Rosencrantz and Guildensternare dead at the end of Kenneth Branagh’s Hamlet (1996). After the main stint of his acting career, Attenborough went on to do multiple different projects. He was elected to the post of Chancellor of the University of Sussex on 20 March 1998, replacing The Duke of Richmond and Gordon. He stood down as Chancellor of the university following graduation in July 2008. There now hangs a 42 inch by 46 inch portrait of him in the university’s library. A lifelong supporter of Chelsea Football Club, Attenborough served as a director of the club from 1969–1982 and between 1993 and 2008 held the honorary position of Life Vice President. On 30 November 2008 he was honoured with the title of Life President at the club’s stadium, Stamford Bridge. Decline in Health and Death. In August 2008 Attenborough entered hospital with heart problems and was fitted with a pacemaker. In December 2008 he suffered a fall at his home after a stroke, and was admitted to St George’s Hospital in Tooting, southwest London. In November 2009 Attenborough, in what he called a “house clearance” sale, sold part of his extensive art collection, which included works by L. S. Lowry, Christopher R. W. Nevinson and Graham Sutherland, generating £4.6 million at Sotheby’s. In May 2011, David Attenborough revealed that his brother had been confined to a wheelchair since his stroke in 2008, but was still capable of holding a conversation. 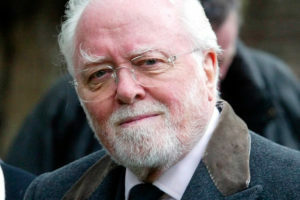 He added that “he won’t be making any more films.” In March 2013, in light of his deteriorating health, Attenborough moved into a nursing home in London to be with his wife, as confirmed by their son Michael. Attenborough died on 24 August 2014, five days before his 91st birthday. Richard Attenborough was survived by his wife of almost 70 years, their two surviving children, six surviving grandchildren and a great-grandchild.